Last spring, when Prince died, I wrote about all the near misses I'd had trying to see him perform live. I never managed it, and in writing that piece, I couldn't help but start a mental inventory of other great artists I had yet to see—a sort of "please don't kick the bucket" list. 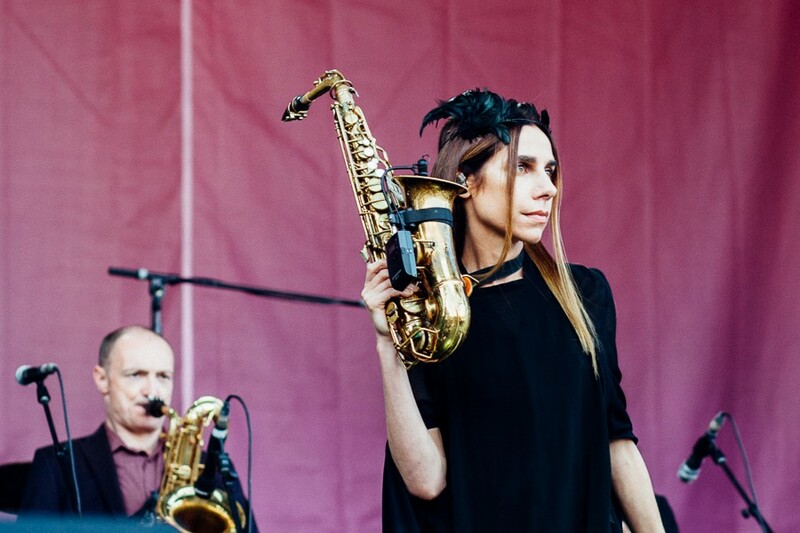 On that list, PJ Harvey is definitely near the top. 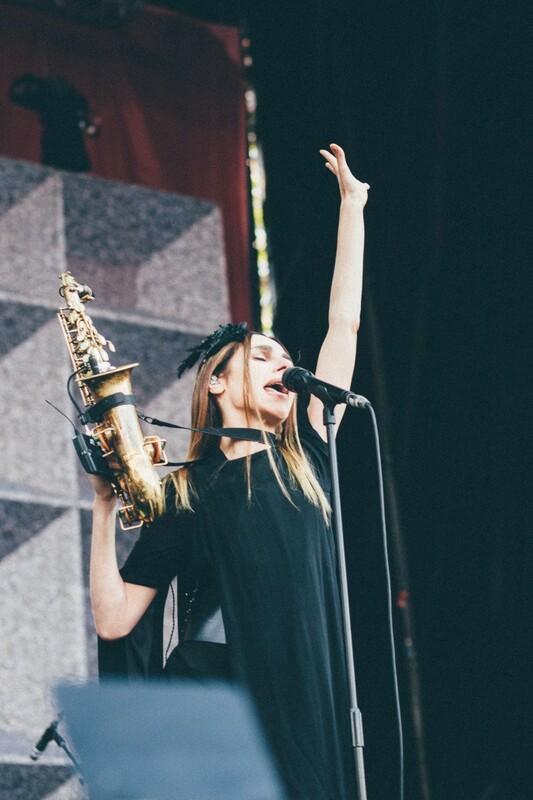 So when Pitchfork announced this year's festival lineup, she became my must-see. Based on a totally informal poll of other attendees, I was not alone. Among what I'm going to go ahead and call the "Nirvana generation" of artists—or 90s alternative rockers, if you must—Harvey is notable (and even more beloved) because she's never made any off-putting left-field pronouncements, stooped to craven self-promotion, or taken an ugly career turn. While not all of her albums are immediate grabbers, homegirl isn't about to go nuclear and lay down an album of embarrassing grime tracks. That doesn't mean her music hasn't become more topical. 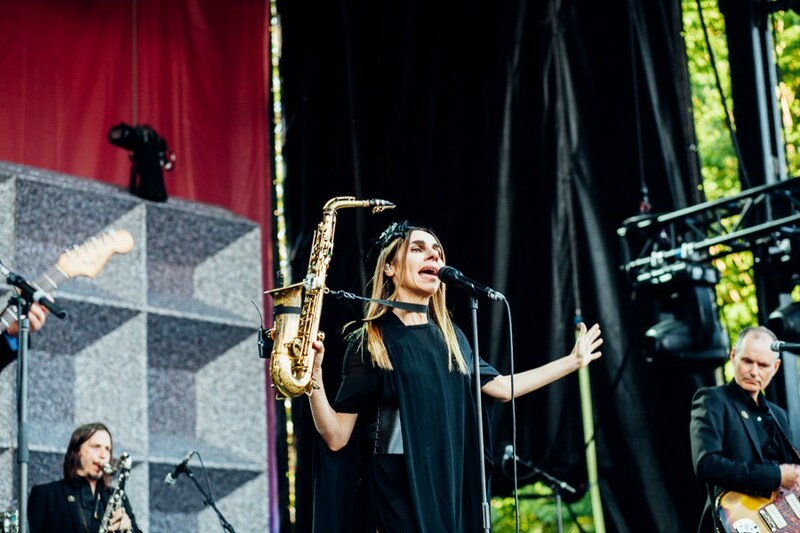 After two decades of crafting intense, moving torch songs in a small-band context—largely relying on explosive guitar chops in her earlier discography—Harvey has switched to a kind of chamber pop on her two most recent records, 2011's Let England Shake and last year's The Hope Six Demolition Project, making "big picture" works that focus on far more epic forms of human suffering, among them war, poverty, and homelessness (spiritual and otherwise). In that spirit—much as Godspeed You! 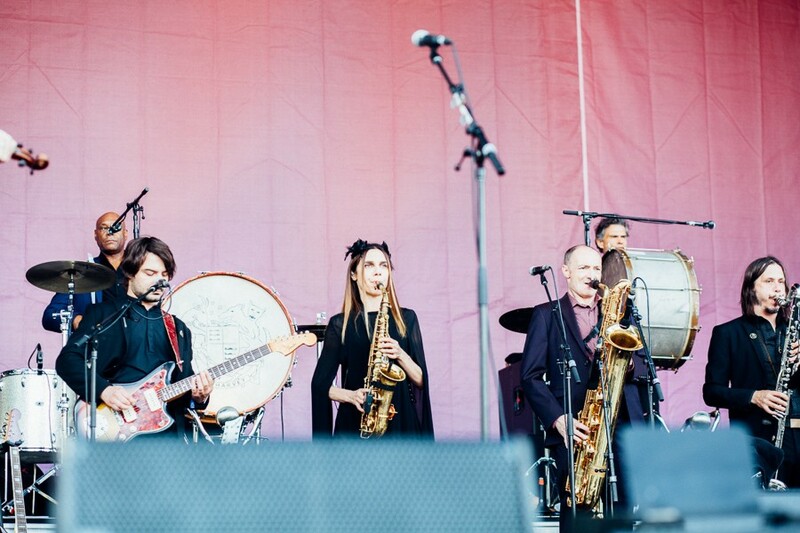 Black Emperor used to do—Harvey and her eight-piece backing band walked onstage Saturday night playing a tap-tap rhythm like a marching band, their leader almost anonymous in the middle, honking a saxophone as though she were just another member of the backline. The large video screens, which had been in color for every other performer, switched to black-and-white (which Pitchfork's video team later told me was at the artist's request). Harvey and her sidemen make a marching-band entrance. And the group settles in. Harvey opened with a trio of cuts from Hope Six, and I was immediately reminded why I haven't listened to that album much. Unlike the vast majority of Harvey's catalog, many of these songs—which detail American colonialist escapades and the lives of the downtrodden left behind in Kosovo, Afghanistan, and somewhat controversially Washington, D.C.—have the air of an uninspired lecture about them, despite their worthwhile subject matter. 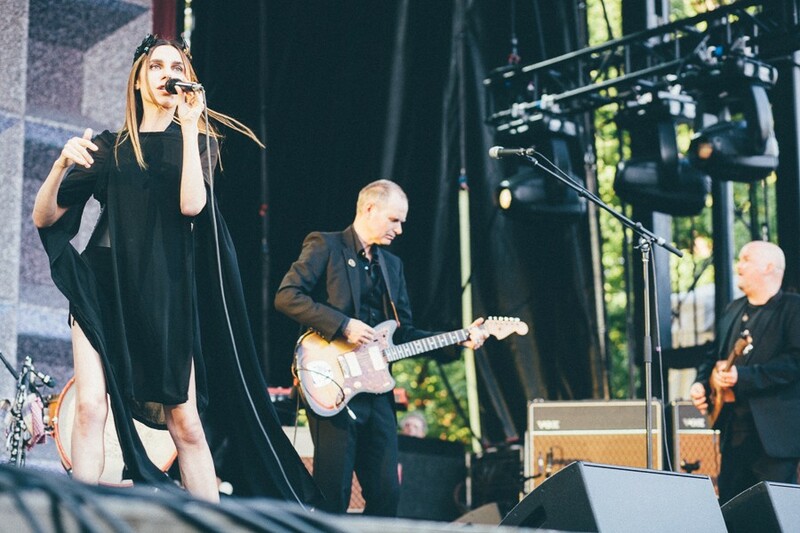 Harvey was in fine (if slightly muted) voice, and her band's graceful fluidity was on sure display—especially from two longtime collaborators, guitarist John Parish and multi-instrumentalist and former Bad Seed Mick Harvey—but there wasn't much frisson to be heard. I can't have been the only fan sorry that Harvey—among her generation's most accomplished electric-guitar players—didn't so much as sniff at an ax all night long. She might have moved past her role as the stomping, amp-roasting riff monster at the heart of Dry and Rid of Me, but I certainly haven't. Most of the densely packed audience around me toward stage right didn't seem particularly engaged at that point either. But as the set wound on, material from England (in particular a stirring rendition of "The Glorious Land") upped the ante a bit. By the time her band got around to cranking out a few old favorites, including a teasing, elegant version of "Down by the Water" and a pummeling Stooges-esque reading of "50 Ft Queenie" (which got by far the biggest crowd response of the evening), all seemed forgiven. The set ended even more strongly, with a elegiac version of "To Bring You My Love" buttressed by bristling baritone saxophone from former Gallon Drunk guy Terry Edwards, then a fitting close via Hope Six's strongest song, "River Anacostia." 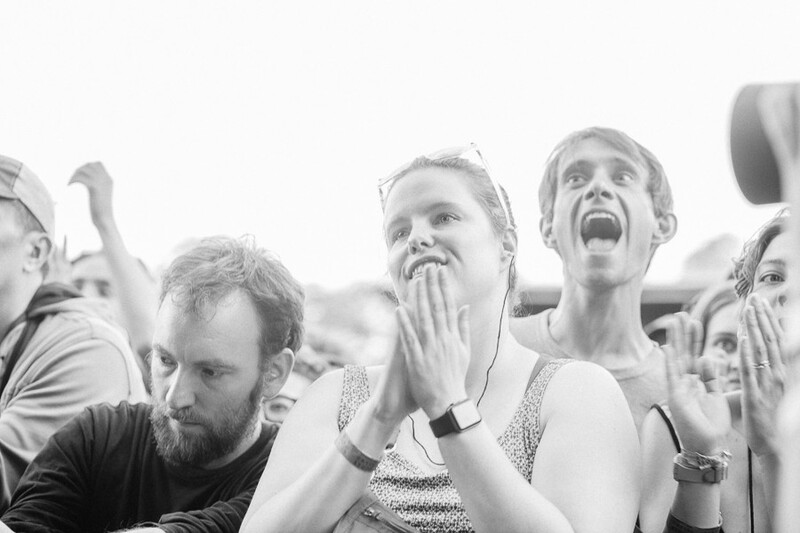 But in the cruel custom of the festival grounds, before her band had even finished the song's glistening coda, most folks' attention had already turned to the Green Stage in anticipation of A Tribe Called Quest. Is that an invisible orange? A Reader intern discovers the life of excitement and glamour that is journalism. Veteran New Jersey rock combo the Feelies manipulated time and space at the Pitchfork Music Festival on Saturday. Phife Dawg didn't live long enough to finish recording A Tribe Called Quest's first album in nearly two decades, but his presence hung over the group's Pitchfork set. Venezuelan producer Arca and video artist Jesse Kanda played with the binary of attraction and revulsion to reprogram the default modes of consumption at a music festival. 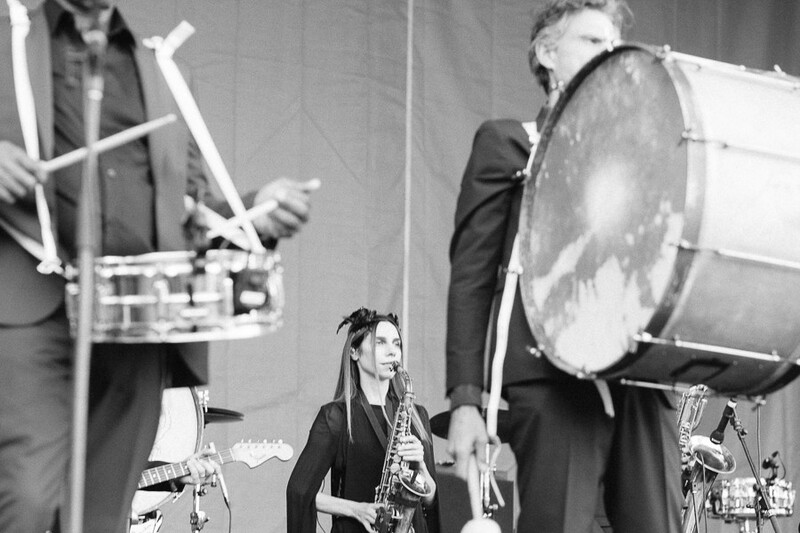 LCD Soundsystem, PJ Harvey, and Ride have had mixed success evolving past the sounds that made them famous. The Purple One could make sheer perfection feel possible for anyone—even a ten-year-old white kid from Crystal Lake. Plus: Footwork crew the Era screens short films in Hyde Park, and Avondale bar Reed’s Local celebrates five years with three days of music. Plus: The former Mama jammers in Bandy celebrate a new tape, and DJ and soul historian Duane Powell shines a light on songwriter Eugene McDaniels. Plus: Self-described “Bruce jazz” trio Poplife play a farewell-for-now show, and drummer Spencer Tweedy drops an EP as a front man.